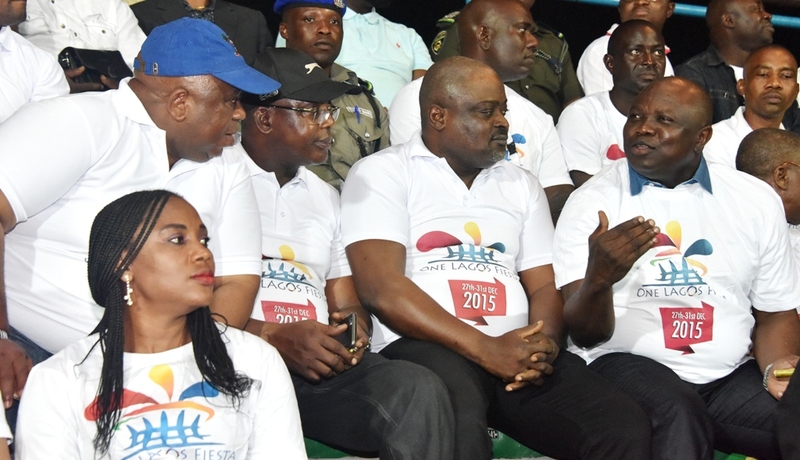 Lagos State Governor, Mr. Akinwunmi Ambode(2nd left), addressing fun lovers and Agege residents, during the flag off of the One Lagos Fiesta, at the Agege Mini Stadium, Agege, Lagos, on Sunday, December 27, 2015. (L-R) With him are Speaker, Lagos State House of Assembly, Rt. Hon. Mudashiru Obasa; Minister for Information & Culture, Alhaji Lai Mohammed and Commissioner for Tourism, Arts & Culture, Mr. Folorunsho Coker. Lagos State Governor, Mr. Akinwunmi Ambode; Speaker, Lagos State House of Assembly, Rt. Hon. 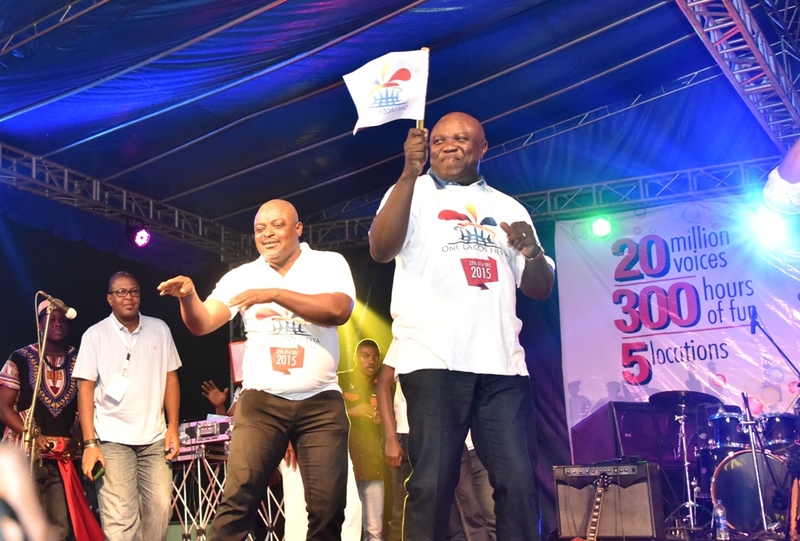 Mudashiru Obasa and Commissioner for Tourism, Arts & Culture, Mr. Folorunsho Coker, during the flag off of the One Lagos Fiesta, at the Agege Mini Stadium, Agege, Lagos, on Sunday, December 27, 2015. 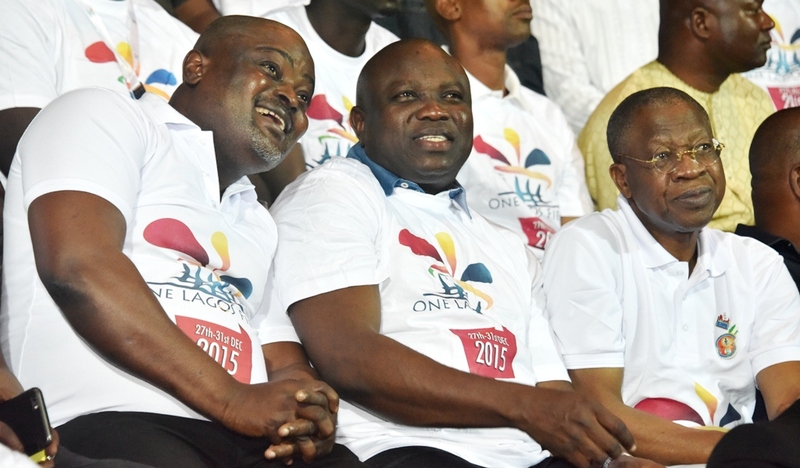 Lagos State Governor, Mr. Akinwunmi Ambode (2nd left), with Speaker, Lagos State House of Assembly, Rt. Hon. 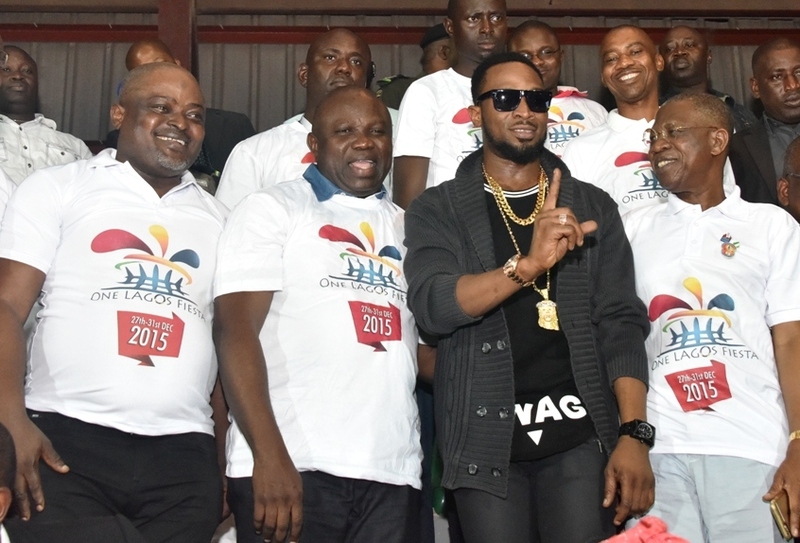 Mudashiru Obasa; International Music Act, Dapo Oyebanji popularly known as Dbanj and Minister for Information & Culture, Alhaji Lai Mohammed, during the flag off of the One Lagos Fiesta, at the Agege Mini Stadium, Agege, Lagos, on Sunday, December 27, 2015. 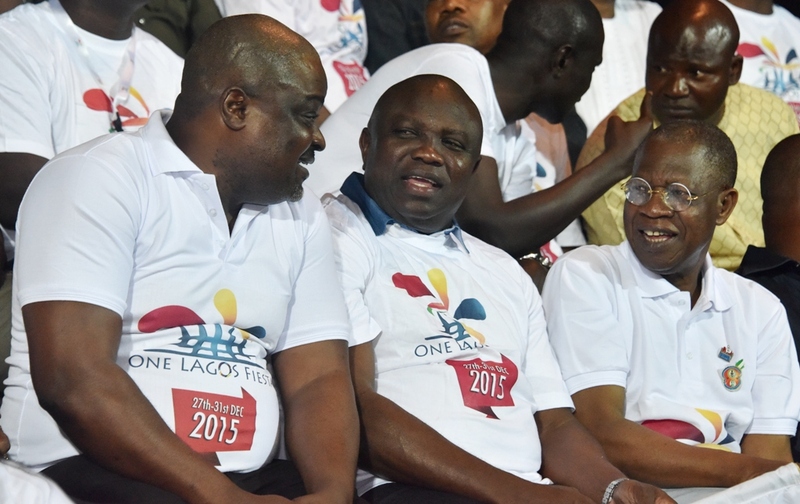 Lagos State Governor, Mr. Akinwunmi Ambode (middle), with Speaker, Lagos State House of Assembly, Rt. Hon. 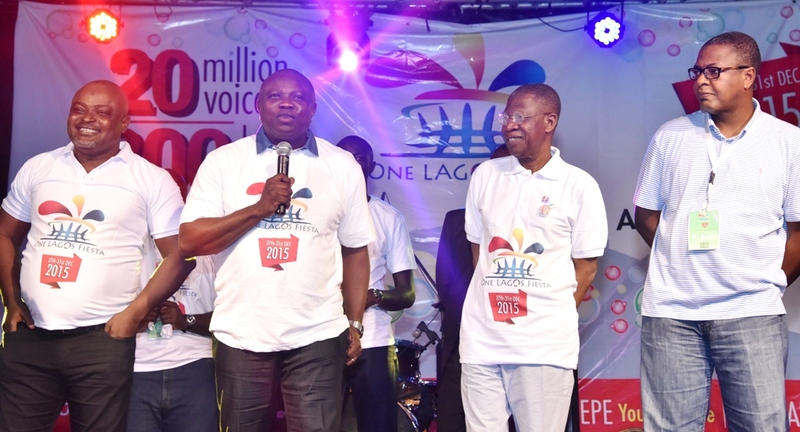 Mudashiru Obasa (left) and Minister for Information & Culture, Alhaji Lai Mohammed (right), during the flag off of the One Lagos Fiesta, at the Agege Mini Stadium, Agege, Lagos, on Sunday, December 27, 2015. 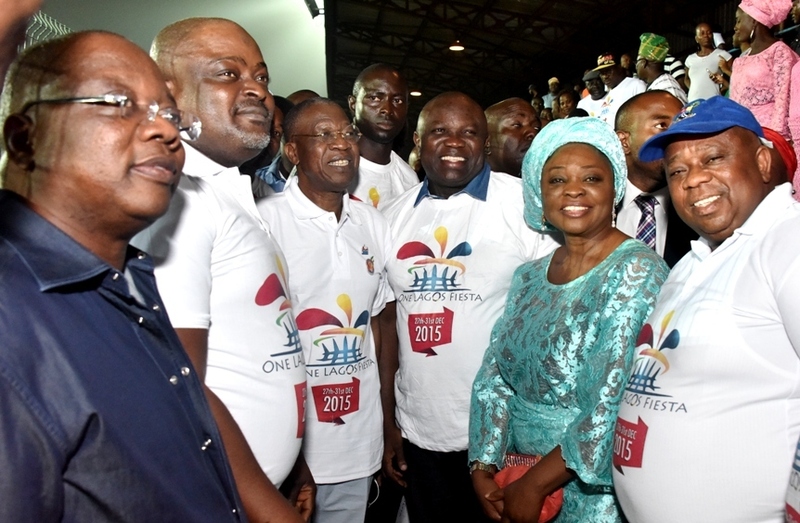 Lagos State Governor, Mr. Akinwunmi Ambode (3rd right), Commissioner for Works & Infrastructure, Engr. Ganiyu Johnson; Speaker, Lagos State House of Assembly, Rt. Hon. Mudashiru Obasa; Minister for Information & Culture, Alhaji Lai Mohammed; Commissioner for Women Affairs & Poverty Alleviation (WAPA), Mrs. Lola Akande and Commissioner for the Environment, Dr. Babatunde Adejare, during the flag off of the One Lagos Fiesta, at the Agege Mini Stadium, Agege, Lagos, on Sunday, December 27, 2015. Lagos State Governor, Mr. Akinwunmi Ambode; Speaker, Lagos State House of Assembly, Rt. Hon. Mudashiru Obasa, Commissioner for Establishment & Training, Dr. Benson Akintola; Commissioner for the Environment, Dr. Babatunde Adejare and Executive Secretary, Mosan-Okunola Local Council Development Area (LCDA), Hon. 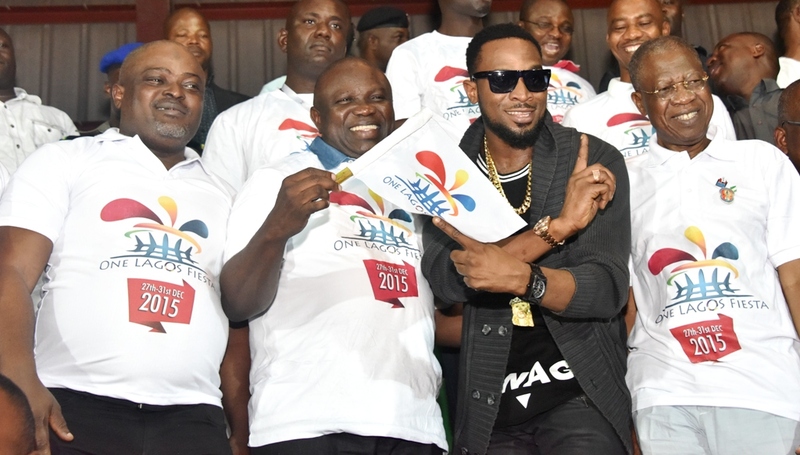 Opeyemi Akindele, during the flag off of the One Lagos Fiesta, at the Agege Mini Stadium, Agege, Lagos, on Sunday, December 27, 2015. Lagos State Governor, Mr. Akinwunmi Ambode on Wednesday congratulated Nigerians as the nation marks its 55th Independence Anniversary as a sovereign state, saying patriotism and selfless service are two aspects that can truly reflect the essence of the country’s Independence. The Governor in a statement signed by his Chief Press Secretary, Mr. Habib Aruna, said the period of Independence must not be lost on anyone, urging Nigerians to rededicate themselves to the pride and service of the nation as exemplified by her founding fathers. The Governor said there was need to rekindle the flame that ignited the determination of the founding fathers to fight for and obtain independence and the pride they had in serving the country adding that there was no better time than now to reawaken the waning glory of the nation. “You would recall that Nigeria’s first Prime Minister, Alhaji Abubakar Tafawa Balewa, had on that memorable day, 55 years ago, in his Independence Anniversary speech, admonished everyone to dedicate their life and service to our country. This, for me is the springboard that can take help us return to our glorious past that the likes of Pa Anthony Enahoro, Chief Obafemi Awolowo, Dr. Nnamdi Azikiwe, Sir Herbert Macaulay and a host of others helped to build in their time”, he said. He said the 2015 elections was a period that handed the nation a lifeline to put her back on track and reclaim its waning glory as the giant of Africa, urging all Nigerians irrespective of party affiliation, religious belief or ethnic leaning to join hands with the government of the day to salvage the nation. He also called on Nigerians to support the ongoing efforts by President Muhammadu Buhari’s administration to rebuild the nation’s foundation, saying such efforts could not be left to the government alone. He expressed optimism that the Buhari administration will succeed in its quest to reduce the rate of poverty, fight corruption, change the economic fortunes and stem the tide of insecurity in the country especially in North East Nigeria, saying it would however require all hands to be on deck. Wife of the Lagos State Governor, Mrs. Bolanle Ambode, on Thursday unveiled the lineup of events for the forthcoming Annual National Conference of the Committee of Wives of Lagos State Officials (COWLSO), scheduled to hold from Wednesday, 16 to Friday, 18 September, 2015. Ambode, while briefing journalists at the Bagauda Kaltho Press Centre, Alausa, said the theme of this year’s conference, ‘Relevance in Economic Turbulence’, would among other things, examine the role of women in economic downturn, especially to orientate them on how they can successfully turn the unpleasant global economic environment to the advantage of their families and society in general. She said over 1,500 participants are being expected to attend, just as he she assured that the conference will provide new insights into establishing and maintaining good quality life and is expected to be an enriching experience for all participants. Wife of Lagos State Governor & the Chairman, Committee of Wives of Lagos State Officials (COWLSO), Mrs. Bolanle Ambode (middle), fielding questions from the press, the Publicity Secretary, National Women Conference (NWC), Mrs. Oladunni Ogunbamiro (left) and Wife of the State Chairman, APC, Mrs. Adetoun Ajomale (right) during a press briefing on the upcoming 2015 National Women Conference, at the Bagauda Kaltho Press Centre, the Secretariat, Alausa, Ikeja, on Thursday, September 03, 2015. “The conference will provide new insights into establishing and maintaining good quality life and is expected to be an enriching experience for all participants”, she said. Responding to a question on the criteria of the Inspirational Woman of the Year Award, Mrs. Ambode, who is the Chairman of COWLSO, said though the award is strictly for a distinguished Nigerian Woman, who has excelled in her chosen career and mentored other women, it is also important that such women shares and supports the vision of COWLSO. “There is no way any woman any woman who has mentored other women, through her activities in her chosen career, won’t share the vision of COWLSO. There will also be a presentation of certificates of appreciation to notable individuals to recognize others who were nominated for the receipt of the award”, she said. She listed some of the selected topics to be treated at the conference to include ‘The Woman, The Economy and Challenging Times, The Future Counts-Save Today Thrive Tomorrow, Skills- A Sure Way To Sustainable Wealth And Government’s Support For The Women In Challenging Times’, among others. 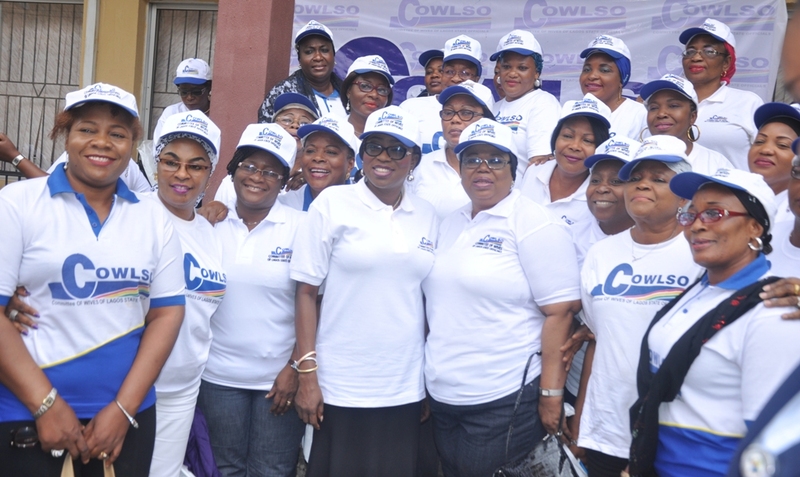 Wife of Lagos State Governor & the Chairman, Committee of Wives of Lagos State Officials (COWLSO), Mrs. Bolanle Ambode (middle), the Publicity Secretary, National Women Conference (NWC), Mrs. Oladunni Ogunbamiro (3rd left), Chairperson, Planning Committee, NWC 2015, Mrs. Rhoda Ayinda (2nd left) with some members of COWLSO during a press briefing on the upcoming 2015 National Women Conference, at the Bagauda Kaltho Press Centre, the Secretariat, Alausa, Ikeja, on Thursday, September 03, 2015. She said that the conference will be declared open by the Governor of Kebbi State, Alhaji Atiku Bagudu and declared closed by the governor of the State of Osun, Ogbeni Rauf Aregbesola, adding that the conference fee is N50,000 only. She also listed some of the resource persons expected to speak at the Conference to include the former Head of Women In Business (WIMBIZ), Mrs. Toyin Adeniji, Managing Director, Access Bank Plc, Mr. Herbert Wigwe, Permanent Secretary, Lagos State Ministry of Women Affairs and Poverty Alleviation, Mrs. Bola Dapo-Thomas among others. She said the Conference which will hold at the Convention Centre, Eko Hotels and Suites, will be streamed live on the internet to afford social media enthusiasts the opportunity to be part of the event from anywhere in the world. 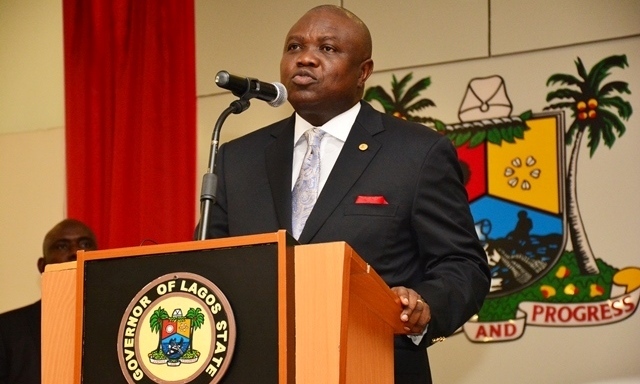 Lagos State Governor, Mr. Akinwunmi Ambode on Wednesday swore in 19 new Permanent Secretaries in the State Civil Service with a call on the new appointees to immediately get to work and prove themselves, just as he urged them to make the common good of all Lagosians their watchwords. The Governor, at the ceremony held at the Banquet Hall, Lagos House, Alausa, admonished the new appointees to ensure proficiency in the discharge of their duties, charging them to be committed to the principles of good governance, probity, transparency and accountability. “I expect you to apply the best tenets of the Civil Service in your roles as Permanent Secretaries, making service and the common good of all Lagosians your watchwords”. 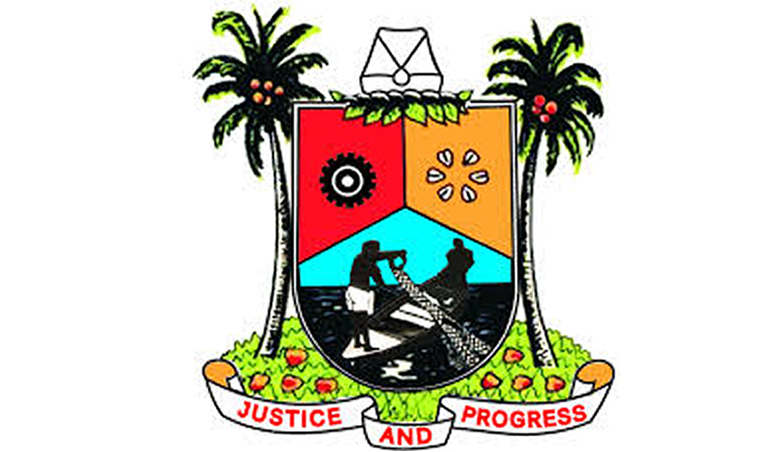 “Your primary allegiance is to the people of Lagos, irrespective of creed or colour. This is the banner of this administration. 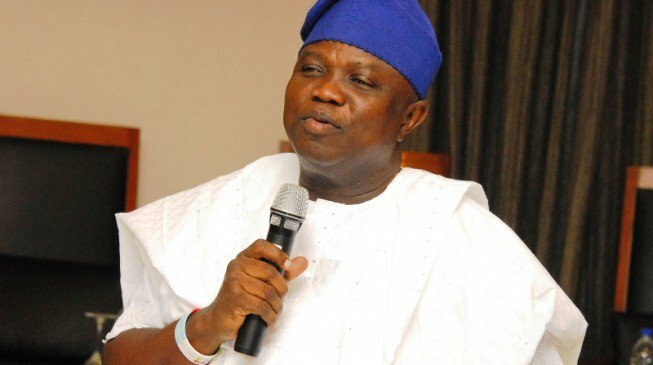 You must today rededicate yourselves to the service of Lagos State”, he said. 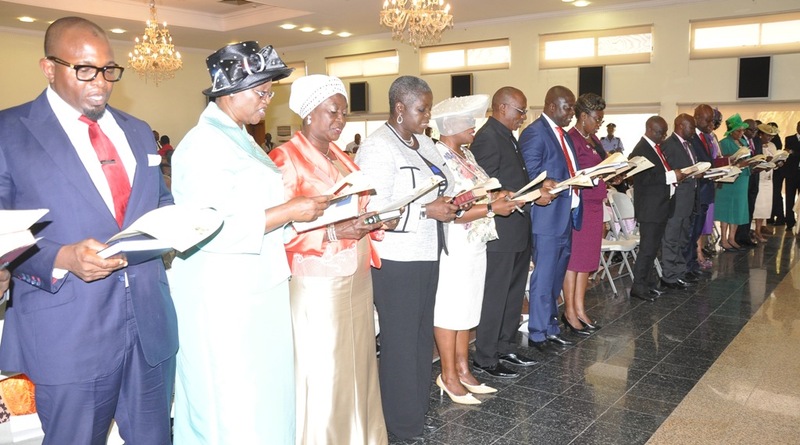 A cross section of the newly appointed 19 Permanent Secretaries taking their Oath of Office before the Director, Legislative Drafting, Ministry of Justice, Mrs. Tola Akinsanya (left) presided by Governor Ambode at the Banquet Hall, Lagos House, Ikeja, on Wednesday, August 05, 2015. Governor Ambode said that the quality of service by his administration will be measured on daily basis, hence the Permanent Secretaries must up the ante and be alive to their responsibilities. “Any ministry where the quality of service is compromised, the Permanent Secretary, as Accounting Officer, should be held liable. I expect nothing but excellence in this centre of excellence”, he said. 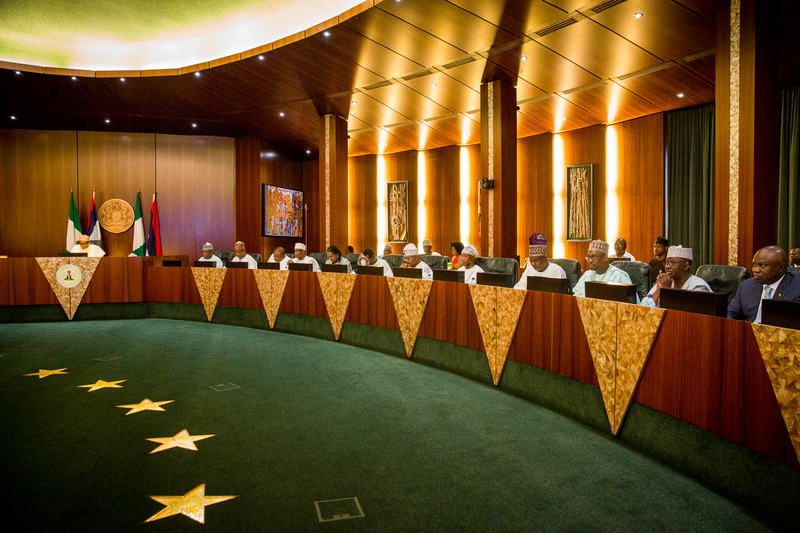 He said the Permanent Secretaries were drawn from a pool of equally competent and qualified substantive directors, while a careful selection was done based on merit, professionalism and proven track record of service to the state. Governor Ambode said the intention of his government was to carry out public sector reforms in line with one of his campaign promises to run an inclusive government and create better opportunities for residents. He said the next phase of his administration’s agenda will involve constituting the State Executive Council so as to consolidate on the foundation laid in the last 60 days. Earlier, the State Head of Service, Mrs. Folashade Jaji, who presented the new appointees to the Governor, thanked him for recognizing exemplary performance and merit as core criteria for elevation into accountable posts in the state public service. “There is no doubt in my mind that with these appointments, a strong message has been sent across in the state public service by His Excellency that diligence, dedication, commitment, loyalty and hard work will ultimately be rewarded”, she said. Speaking on behalf of her colleagues, Mrs. Adekanye Elizabeth Adebunmi, now Permanent Secretary, Office of Civic Engagement, pledged that the confidence reposed in them to serve the state in a higher capacity will be diligently achieved. The ceremony which was attended by retired Heads of Service and Permanent Secretaries also had family, friends and well wishers of the newly sworn in Permanent Secretaries in attendance. 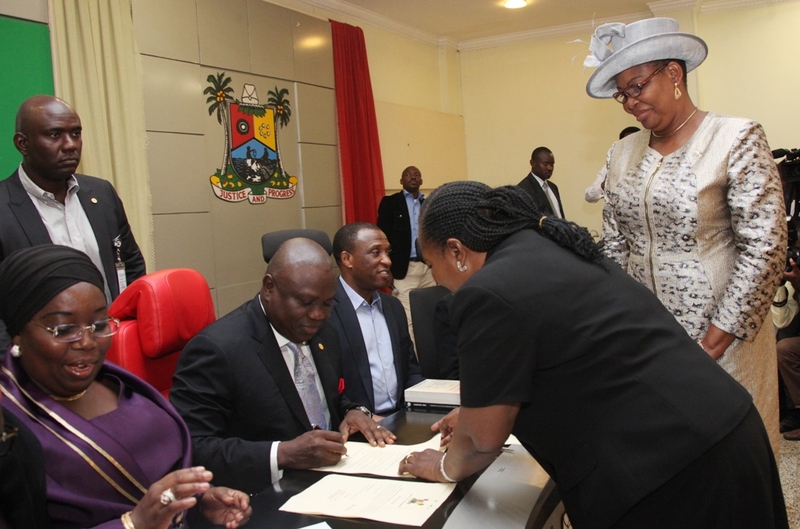 Lagos State Governor, Mr. Akinwunmi Ambode (2nd left) signing the Oath of office of Mrs. Elizebeth Adebunmi Adekanye (2nd right) as Permanent Secretary, Office of Civic Engagement, being conducted by the Director, Legislative Drafting, Ministry of Justice, Mrs. Tola Akinsanya (right) during the swearing-in of the 19 newly appointed Permanent Secretaries at the Banquet Hall, Lagos House, Ikeja, on Wednesday, August 05, 2015. With them are Deputy Governor, Dr. (Mrs.) Oluranti Adebule (left), Secretary to the State Government, Mr. Tunji Bello (3rd left).